18-month-olds are so cute. They look like tiny little people but still retain some baby fat and chubbiness. 18-month-olds are experts in charm with their cute little antics and smiles. This cuteness is essential to help you forgive them for the chaos and destruction that they tend to create around them. If you are shopping for an 18-month-old, it’s a pretty fun experience as so much still amazes them easily. However, what kind of present would also be appropriate for their developmental needs? To figure this out, it helps to understand the developmental stages of an 18-month-old. Below are the milestone developments for the different categories of developmental needs. Keep in mind that milestones are just rough guidelines and you should not be too worried if your child is not achieving all of these milestones. One child may be faster than another but this doesn’t mean that there is a problem. If you find that your child is far, far behind, then do consult your child’s pediatrician. This milestone depends on how early your child started walking. Some children take a bit longer to get used to the idea of moving on two feet and if so, won’t be ready to start running just yet. If your child started walking around 12 months, then at 18 months, your child is likely to have mastered the skills of running steadily and will be less likely to crash or bump into stuff. As mentioned before, your adorable, chubby child will be losing “baby fat” because of the amount of physical activity that your child will be doing. Savor what’s left of those cute rolls before they completely disappear! While your 18 month old will be losing “baby fat”, your child’s height and weight gain will start to plateau. Instead, your child starts to develop more rapidly in other areas such as cognitive and linguistic abilities. Whether this makes you laugh or cry, your child will move from two naps to one nap during the day. Your child still needs about 13-14 hours of a sleep in a day and will sleep longer during the night. Prepare for frequent moments of laughter when you find your 18 month old doing the cutest imitations of adults. It could be copying the way you hold your cup, or picking up the telephone or even just browsing on your cell phone. They are not trying to win an Academy award but are merely learning how to be an adult. On top of getting you to laugh, your 18 month old will be eager to show off new skills to fish for compliments and rewards from you. Once you notice that your 18 month old is watching your reaction while doing something forbidden, that’s a sign that it’s time to start disciplining. He or she is trying to figure out boundaries and how far you will allow him or her to be disobedient. Your 18 month old will start being interested in other kids and if they are older, even following them around. He or she may not play directly with these kids but will most likely play alongside or beside them. You may still see your 18 month old as a baby but he or she wants to be treated like an adult. Don’t be surprised if your 18 month old insists on trying to put on their own seat belt, putting on their own shoes etc. Be prepared for epic battles and tantrums. This is a great time to continue to further your 18 month old’s language development. He or she will continue to absorb new words and will be able to say some words too like, ‘hello’, ‘bye’ ‘dog’, ‘duck’ and maybe even short phrases. Even though your 18 month old will be limited in his or her ability to speak, they will be able to understand a huge amount of what you say to him or her. If you haven’t already, it’s time to curb those less-than-desirable words that you say as your 18 month old may start picking it up. Your 18 month old will start wanting to use a spoon and fork as well as drink from a cup. There will be terrible, terrible messes but stay positive, it’s all a part of their development. Your 18 month old will have sufficient fine motor skills to grasp a crayon or chalk to scribble. Now’s the time to make sure that your walls are protected! You may have noticed that your 18 month old insists on trying to put on or take off his or her clothing by himself or herself. They don’t often succeed and may refuse to let you help but cheer up, your 18 month old is merely trying to achieve more independence. One of the cutest things to watch is an 18 month old dancing. They often spin around, do a short, little run across the room, move from side to side and even pick up their feet. Bring out your camera and take some videos for memories. The battles begin now as your 18 month old learns the power of the word “No”. We empathize. Your 18 month old will show interest in wanting to help you out around the house. This could be as simple as bringing you the newspaper or taking clothes to you from the laundry basket for you to fold. Rather than focusing on what they are doing imperfectly, savor this phase of helpfulness for as long as you can. You can even train them to put their toys away at this point. When they were an infant, your child believed that you and they were one body. Your 18 month old now knows that he or she is separate from you. Because of this, they get anxious when they are around strangers and may become especially “clingy”. You can no longer remove the desired item from your child and hope that they will forget all about it immediately. 18 month olds are able to remember things now and your parenting skills will be tested as you have to use other strategies to calm an unhappy 18 month old when you take away a prized possession. 18 month olds love to pretend. They may pretend that their doll is a baby. Or pick up a toy phone and speak into it. Very cute! Although you shouldn’t needlessly worry, toys and play are a great way to assist your 18 month old to hit his or her developmental milestones. Incorporate fun into the process and you won’t have to worry about your 18 month old feeling pressured to perform. Here are our recommendations of the best toys for different developmental needs of an 18 month old. 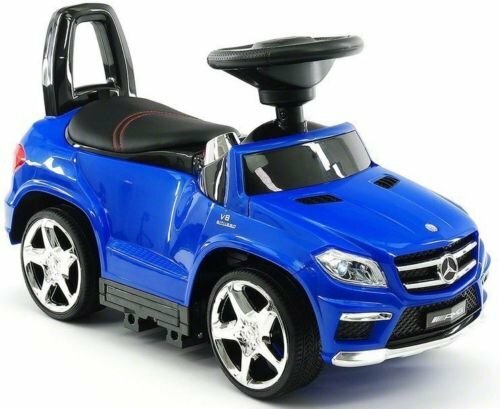 If you are interested in getting your child to practice moving around or walking more while having fun, consider getting your 18 month old this super duper luxurious Mercedes ride-on car. The handle bar can be removed so that your 18 month old can push the car around. Your 18 month old can also sit on the car and use his or her own legs to do the pushing. It is multifunctional so that if he or she gets tired, you can attach the long handle bar and push your child along. As a bonus, this car also converts into an enjoyable rocking car. The car comes with a padded leather seat, steering wheel, MP3 player, tail lights and music buttons. Totally cool toy. Trampolines are a fantastic way for young kids to practice physical movement without hurting themselves. Young kids often have tons of pent-up energy and this trampoline allows them to safely bounce and play while building stamina and exercising muscles. 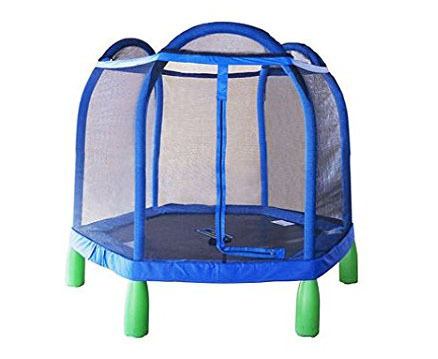 This trampoline has a surrounding net so that your 18 month old can safely bounce in it without fear of falling out. There are no elastic bands and all metal parts are wrapped in foam or plastic to protect your 18 month old from bumps. The steel frame is made of galvanized steel so that it doesn’t rust easily too. The jump mat itself is UV-resistant so that you can leave it out in the sun. The trampoline takes a total weight of 100 lbs so that your child can continue to use it even past 18 months. A jungle gym is another excellent way to build physical strength for young kids. The Panda Indoor Playground is a simple but fun indoor jungle gym for young toddlers. This jungle gym is made from wood and comes with a swing, rope ladder, slide and gymnastic rings. If you don’t need it anymore, this jungle gym can be folded away for storage. An activity center is a great way to help your 18 month old to build emotional and social skills. 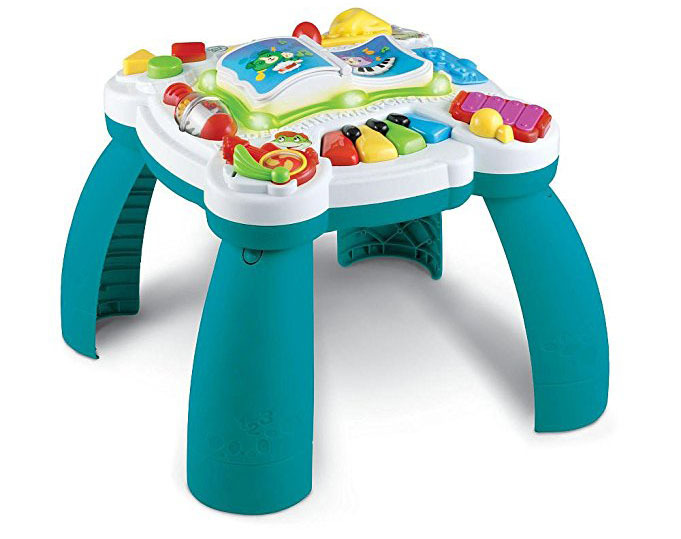 This LeapFrog Activity Center has sufficient activities to allow several kids to play on it at one time. By playing alongside each other and taking turns, your 18 month old learns to share and interact with others. It also promotes sensory development with several kinds of objects to touch including piano keys, an open-shut cover and a page turner. 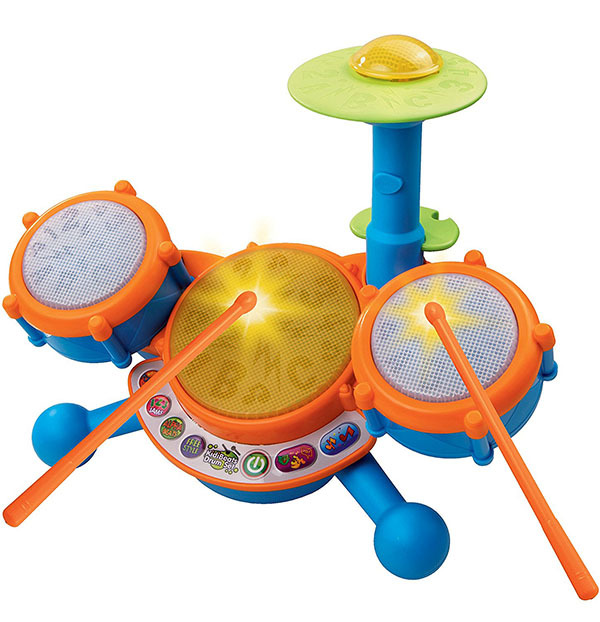 This activity center plays cute music and other sounds and can play in two languages, English and Spanish. This Shop ‘n Cook Walker looks like a shopping cart. It also has a cook top that is removable, sandwich, egg roller, popcorn and shape sorter. 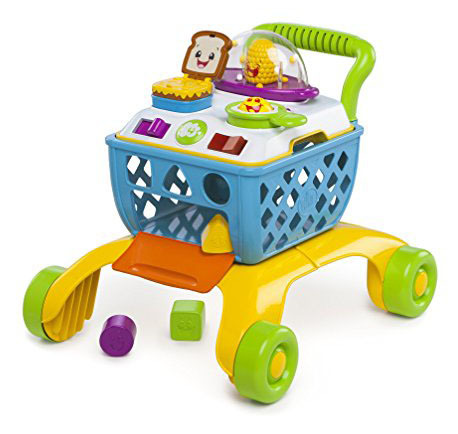 Your 18 month old will have tons of fun pushing this around the house while pretending to be shopping. Make it a time for social and emotional development by inviting other kids to set up shop around the room and buy and sell from one another. Alternatively, this shopping cart’s wheels can be locked down so that it stays in place and your child can use it as an activity table. 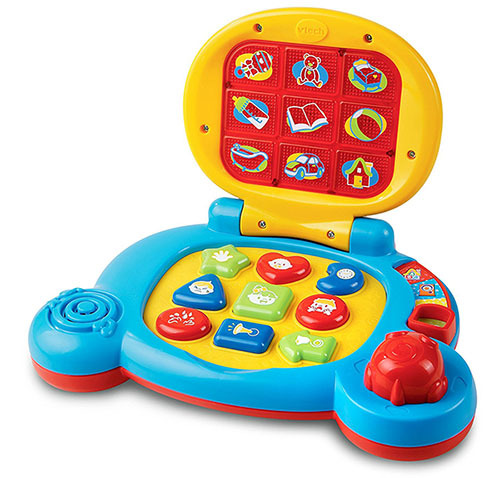 The VTech Baby’s Laptop is great for linguistic development because it says phrases, teaches shapes, common objects, feelings and plays sing-along songs. The VTech KidiBeats is an interactive musical instrument that also teaches letters and numbers while your child taps to the beat. A fun way to introduce the concepts of music, letters and numbers to your 18 month old. Besides toys, it’s a good idea to get a library membership and borrow as many children’s books as you can to read to your 18 month old. Your child will probably learn best when you are engaged with the learning process so we highly encourage you to spend some time every day reading to your 18 month old. 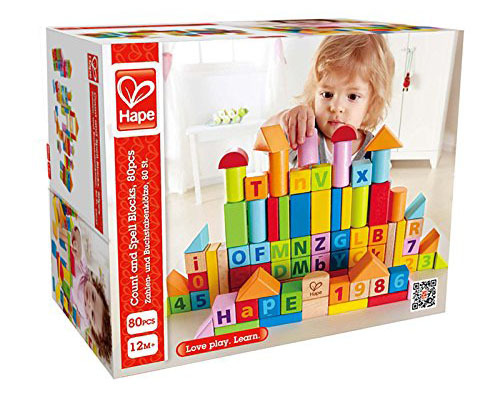 We like the Hape Solid Beech Wood Stacking Blocks because they are useful for the development of sensory and motor skills such as hand-eye coordination through stacking, building and balancing. These blocks are especially colorful and come with several different shapes including circles, columns and triangles. In addition, there are numbers and alphabets painted on some of these blocks so that you can use them to teach the ABCs too. A long time favorite building toy for 18 month olds are LEGOs. LEGOs are well-constructed, non-toxic, super colorful, long-lasting and fun to play with. They are also a great toy for promoting social skills as several kids can get involved with the play. Just make sure that you have enough LEGO bricks to go around. The LEGO 6176 DUPLO Basic Bricks Deluxe (80 Pieces) is a basic starter set that you can easily add other LEGO bricks to. 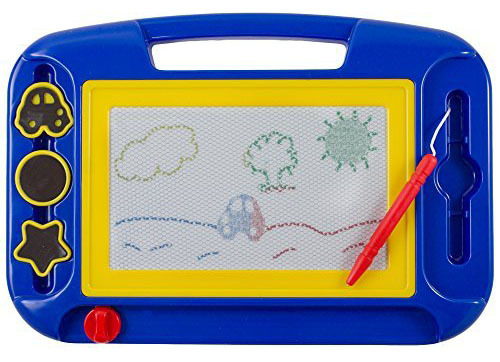 The Kidsthrill Doodle Magnetic Drawing Board is a great way to get your 18 month old started on learning drawing skills. This drawing board comes with a stylus pen as well as three magnet shapes. With this set, you don’t have to worry about your 18 month old drawing on the walls or creating an unholy mess that has to be cleaned up. Play-Doh is a great way to encourage your 18 month old’s imagination, creativity, sensory and motor skills. By molding and shaping, your 18 month old gets to enhance his or her fine motor skills. This set comes in a 10 pack of colors so that your child can mix and match them to create different things. 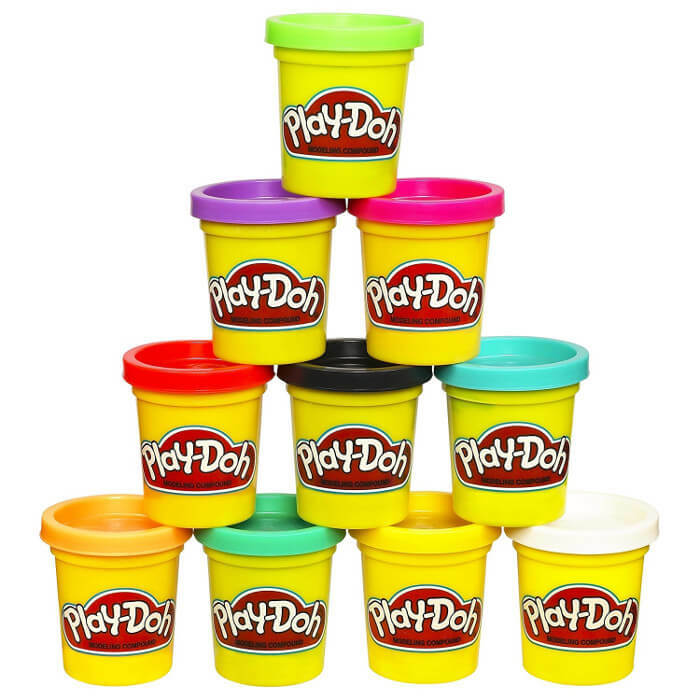 With this particular 10-pack set, there’s going to be enough Play-Doh for shared play with friends too. 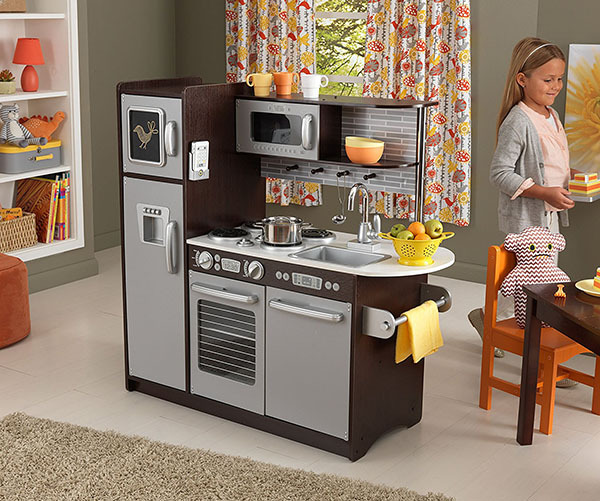 We admit that this KidKraft Uptown Espresso Kitchen might be going a bit far but we can’t help it…if you are a cooking fan, then you will want your 18 month old to have his or her own chef kitchen. This kitchen is designed to mimic a real one. It has a stovetop, sink, microwave, oven, fridge and freezer as well as a dishwasher! There is also a chalkboard for your child to write on. This is another great pretend play toy if you or your child are a fan of home improvement. 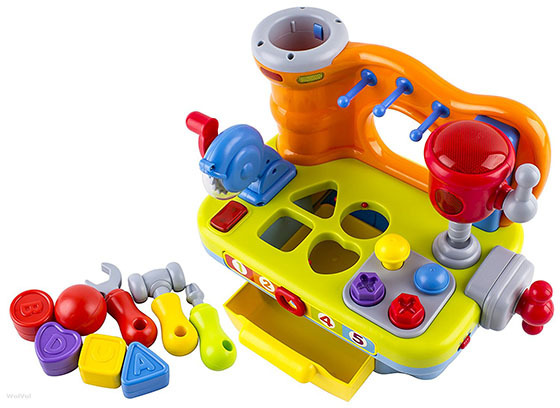 This toy comes with its own pretend workbench, hammer, electric drill, screwdriver, bench clamp and chainsaw. It also plays music and lights. Your child can not only pretend play but there are also shape sorters to hone motor skills. Having an 18 month old is both challenging and fun at the same time. We hope this list of toy recommendations will help you to choose appropriate toys that will enhance your playtime together as well as promote your 18 month old’s development.